AiClay - a Haven of Miniature Food: The most delicious way to learn colours. Do you agree? If I were a kid, I would take eating these colourful treats anytime over looking at boring color cards. These are called iced gems, and I've handsculpted the miniature versions. If you're interested to see whose legs those belong to, more photos could be viewed at my Flickr. Mother's Day was never a competition of the heaviest price tag on the present, it was a day to show how much you care. Remember how happy your Mom was when you gave her a handdrawn Mother's Day card, or that wonky handpainted ceramic cup? Let's recreate that moment this year. Or if your mom is interested in crafting, why not give her an early Mother's Day present by registering for her! 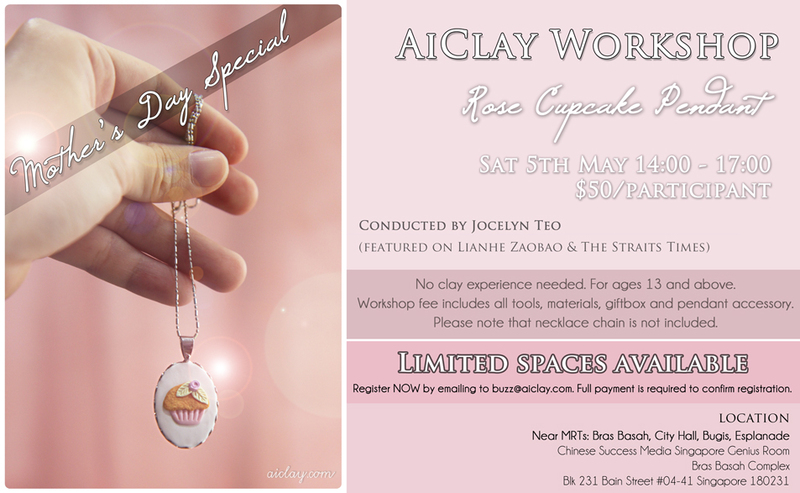 She'll have fun at the workshop and have a pendant at the end of the day to always remember your sweet present. Yes, I'm cutting off the registration slots on 1st May so that I have some time to prepare materials, so that's next Tuesday! For all of those who have indicated Attending on the facebook event page for the workshop, but not emailed me yet, the reason why I require an email registration was so that I can give you my payment information as I only confirm slots upon full payment. So if you're one of them, email me at buzz@aiclay.com NOW pretty please, thank you! I know I sound like a broken radio but I can't stress this enough, and I wouldn't be able to accept participants who just turn up at the workshop without registering.